Since 1843, six generations of our family have farmed in the Willamette Valley of Oregon. Golden Orchard, located on the gentle south slopes of the Tualatin Mountains, produces a distinctive collection of gourmet peach preserves. 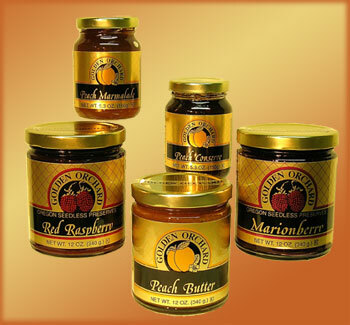 Low-sugar Peach Butter is a light, aromatic blend of the sweetest peaches and the freshest spices. Peach Marmalade is PEACHES with a delicate zest of savory oranges. We also make two delightful berry preserves. Seedless Marionberry Preserves is Oregon's plumpest vine-ripened blackberries picked at their peak of flavor. Seedless Red Raspberry Preserves is a taste of sun-warmed fruit plucked ripe from the vine. 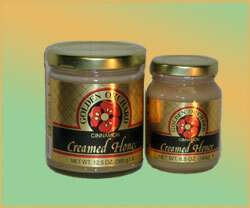 Our deliciously smooth creamed honeys contain only domestic honey and natural fruit or spices. These naturally delicious spreads are available in four flavors: Cinnamon, Golden Peach, seedless Marionberry and seedless Red Raspberry. Our low-sugar Pepper Jelly and fat-free/salt-free Jalapeño Marinade are a little sweet with a little heat. Some of these recipes have been in our family for over a century, others are new. The preserves are beautifully packaged in 5.3 oz and 12 oz. jars; the creamed honeys in 6.5 oz. and 12.5 oz. jars; the Pepper Jelly in 5.3 oz. and 12 oz. jars; and the Jalapeño Marinade in 16 oz. bottles. We also offer a variety of gift packs. and are as delicious as they are beautiful.